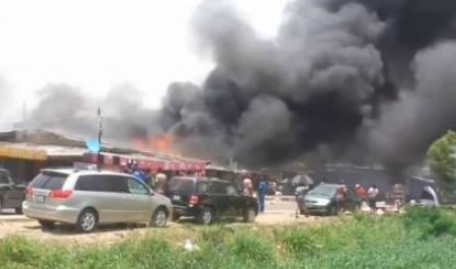 There was a fire outbreak in a building at Babs Animashaun area of Surulere, Lagos yesterday. The fire reportedly broke out after a gas explosion. The extent of the damage is yet to be confirmed but numerous cars were reportedly gutted by the blaze. “This is at Surulere around Babs Animashun area, it was a gas explosion which started right inside a house. Cars have been burnt because their is a mechanic shop very close to building. Calls have been made to the fire service 112, this is a emergency situation."